Vicente de Rocamora, the epitome of a young renaissance man in 17th century Spain, questions the goals of the Inquisition and the brutal means used by King Philip IV and the Roman Church to achieve them. Spain vows to eliminate the heretical influences attributed to Jews, Moors, and others who would taint the limpieza de sangre, purity of Spanish blood. At the insistence of his family, the handsome and charismatic Vicente enters the Dominican Order and is soon thrust into the scheming political hierarchy that rules Spain. As confessor to the king's sister, the Infanta Doa Mara, and assistant to Philip's chief minister, Olivares, Vicente ascends through the ranks and before long finds himself poised to attain not only the ambitious dreams of the Rocamora family but alsoif named Spain's Inquisitor Generalto bring about an end to the atrocities committed in the name of the blood purity laws. The resourceful young man must survive assassination attempts from a growing list of ruthless foes in both Church and court, solve a centuries-old riddle to quell rumors of his own impurity of blood, and above all, suppress his love for the seemingly unattainable Doa Mara. To be fair Donald Michael Platt's Rocamora really comes in at about three and a half stars. I liked the story, but much like Siren of Paris, find the book something of a challenge to review. Fair warning, there is no tiptoeing round the tulips here so the faint--hearted might want to think twice about about this one. The Inquisition was not pretty and though I appreciate the author's bold style, I can see where some readers may have difficulty with this piece. Similarly Platt offers an astounding amount of detail in his narrative. The book is absolutely fascinating, but is without doubt heavy historic fiction and readers should be prepared for that. It is complex storytelling to say the least, but if you can get past that you are in for one heck of a ride. Based on the little known life of Vicente de Rocamora, Platt offers up a thrilling tale of love, honor, revenge, romance, danger and intrigue. Notable for its sweeping historical scope, Rocamora is a meticulously well-researched novel, the story of a charismatic and determined young man who will keep you engaged from the first page to the last. "Revenge can redeem one's honor and remove the stain of an affront, but it never brings back the dead..."
Check out all the stops on the historical fiction VIRTUAL BOOK TOUR of Donald Michael Platt's Rocamora and House of Rocamora. May I start by thanking Erin for participating in my blog tour and giving me the opportunity to post today. For those that have been following the blog tour, you have by now read about why my books are set in the seventeenth century and met my female protagonist Alex Graham. (And if you haven’t read those posts but really want to, why not visit Bippity Boppity Book and Oh, for the Hook of a Book!) It therefore feels appropriate to do an in-depth introduction of my leading guy, and with no more ado, I hereby introduce Matthew Graham. Matthew ducks his head as he enters the room but remains by the door, hat in hand. Outlined against the square of light that is the open door he stands tall – inordinately tall given the times – and with a pleasing width to chest and shoulders. A strong man – a man accustomed to physical work, as can be seen from his forearms and hands, at present rather dirty after a full day out in the fields. “I don’t see the point,” he mutters, slapping his hat against his thigh. “It’s called PR,” I say. Matthew rolls his eyes. I’ve tried to explain this concept to him over and over again, but as far as he’s concerned this is all a waste of time. “I just want to introduce you to my readers,” I say. “Hmm.” Someone laughs in the yard and he turns towards the sound, exposing a strong jaw and straight nose. As he turns back towards me, sunlight strikes him full in the face, and those hazel eyes of his lighten into golden green. “Some background, no more,” I wheedle. With a sigh he comes over to join me by the table, sitting down on one of the stools. He leans back against the wall, extends his long legs and crosses them at the ankle. His thighs bunch and relax under the coarse homespun of his breeches. He needs a shave, his cheeks covered by dark stubble that is highlighted by the odd streak of deep chestnut. Matthew clears his throat and I retake my eyes. It makes him smile. “Background, aye?” And with that he begins to talk. Okay, so I’m not going to bore you with his detailed description of his childhood. At times I think he forgets I’m sitting there, so sunk is he in his memories. He describes a very religious home, a place where having regular conversations with God was the norm. But his mother laughs and sings, she berates God loudly when he’s inconsiderate enough to let it rain on her drying laundry, blows kisses to the heavens when the harvest is bountiful. His father is another matter; Malcolm Graham practices a stern faith, and as a consequence so do his children – and in particular his eldest son. His speech slows when he tells me of his years in the Commonwealth Army. A boy growing to a man amongst so much violence … It makes me shudder, but he speaks of his comrades and officers with warmth and respect, and I come to realise just how much these men have shaped him into what he is today, a man with a deep seated belief in every man’s right to have a say in how he’s governed. He breezes over the details of the battles he took part in, is equally brief as he recounts his courtship of Margaret, his first wife. He says her name carefully, as if his mouth fills with thorns when he pronounces it. And as to Luke … Matthew refuses to say a word about his brother – well, beyond cursing him for being the misbegotten, treacherous pup that he is. “Three years,” he says. “That’s what yon miscreant has cost me. Three years of non-life, of one endless day after the other, so alike there was no way of knowing if it was Sunday or Thursday, March or October. Well, mayhap the Sunday part is not correct; there’d be a minister come to visit us every now and then, long sermons about our duty to the Realm and the Lord Protector, very little about Our Lord’s mercy. It wasn’t as if I had betrayed the Commonwealth, but no matter what I said no one believed me. So I stopped talking – beyond the necessities.” He has twisted his hands together and spends some minutes studying the way his fingers braid around each other. “Gold buys you favours everywhere,” Matthew says. “And he paid them well enough to hope I’d die of it.” His shoulders tense under the linen of his shirt. His back is decorated with scars courtesy of those floggings, and he’s terribly self-conscious about his broken skin. The roof had given way with a rending sound and he’d fallen to land in a bed, atop a woman - an old crone with no teeth. Fortunately she’d been alone in the bed that took up most of the space in the little garret room. “Ah.” I can imagine that hadn’t been too much of a sacrifice. A man like Matthew Graham in your bed … I waggle my brows. He looks at me from under his lashes – long, dark lashes – and smiles, his long lips curving in a way that makes me feel a ridiculous urge to giggle. I don’t. “So why did she hide you?” I ask. “For her or for you?” I ask, touched by his tone. “Life,” he says, covering his dark, wavy hair with his hat. “Alex?” he shouts as he steps into the yard. “Over here,” I hear her call back. I rise to peek at them through the little window. Two people walking off towards the moor, so synchronized they walk like one. By the time they’ve crossed the yard she is fused to his side, her arm round his waist, his arm round her shoulders. “Lucky girl,” I say out loud. Or is she? After all, I haven’t quite made up my mind as to how this story will end. I chew on my pencil and watch them out of sight. My next guest post in this blog tour is about that most elusive noun, inspiration. You’ll find it on Historical Fiction Connection on March 29. Hope to see you there! About the Author: I was raised abroad, on a pungent mix of Latin American culture, English history and Swedish traditions. As a result I’m multilingual and most of my reading is historical - both non-fiction and fiction. I was always going to be a writer - or a historian, preferably both. Instead I ended up with a degree in Business and Finance, with very little time to spare for my most favourite pursuit. Still, one does as one must, and in between juggling a challenging career I raised my four children on a potent combination of invented stories, historical debates and masses of good food and homemade cakes. They seem to thrive … Nowadays I spend most of my spare time at my writing desk. The children are half grown, the house is at times eerily silent and I slip away into my imaginary world, with my imaginary characters. Every now and then the one and only man in my life pops his head in to ensure I’m still there. I like that – just as I like how he makes me laugh so often I’ll probably live to well over a hundred. I was always going to be a writer. Now I am - I have achieved my dream. About the Book: Matthew Graham committed the mistake of his life when he cut off his brother's nose. In revenge, Luke Graham has Matthew abducted and transported to the colony of Virginia to be sold as indentured labour. Matthew arrives in Virginia in May 1661 and any hope he had of finding someone willing to listen to his story of unlawful abduction is quickly extinguished. If anything, Matthew's insistence that he is an innocent man leads him to being singled out for the heaviest tasks. Insufficient food, gruelling days and the humid heat combine to wear him down. With a sinking feeling, he realises no one has ever survived their seven years of service on the plantation Suffolk Rose. Fortunately for Matthew, he has a remarkable wife. Alex Graham has no intention of letting her husband suffer and die. So she sets off from Scotland on a perilous journey to bring her husband home. Alex is plagued by nightmares in which Matthew is reduced to a wheezing wreck by his tormentors. Sailing to Virginia, she prays for a miracle to carry her swiftly to his side. But fate has other plans, and what should have been a two month crossing turns into a year long adventure - from one side of the Atlantic to the other. Will Alex find Matthew in time? Will she be able to pay the price of setting him free? 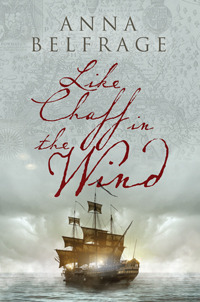 Like Chaff in the Wind continues on from The Rip in the Veil, taking Alex and Matthew's love story to a new continent. Matthew Graham committed the mistake of his life when he cut off his brother's nose. In revenge, Luke Graham has Matthew abducted and transported to the colony of Virginia to be sold as indentured labour. Matthew arrives in Virginia in May 1661 and any hope he had of finding someone willing to listen to his story of unlawful abduction is quickly extinguished. If anything, Matthew's insistence that he is an innocent man leads him to being singled out for the heaviest tasks. Insufficient food, gruelling days and the humid heat combine to wear him down. With a sinking feeling, he realises no one has ever survived their seven years of service on the plantation Suffolk Rose. Fortunately for Matthew, he has a remarkable wife. Alex Graham has no intention of letting her husband suffer and die. So she sets off from Scotland on a perilous journey to bring her husband home. Alex is plagued by nightmares in which Matthew is reduced to a wheezing wreck by his tormentors. Sailing to Virginia, she prays for a miracle to carry her swiftly to his side. But fate has other plans, and what should have been a two month crossing turns into a year long adventure - from one side of the Atlantic to the other. Will Alex find Matthew in time? Will she be able to pay the price of setting him free? Like Chaff in the Wind continues on from The Rip in the Veil, taking Alex and Matthew's love story to a new continent. I don't know if it was the cover or the premise that drew me to Anna Belfrage's Like Chaff in the Wind, but I jumped when offered the opportunity to read the book and thankfully my enthusiasm was rewarded with a surprisingly engaging story. For the record I haven't read book one of The Graham Saga which is probably why I felt I was playing a little bit of catch up heading straight into book two, but even so I really enjoyed this one. By far my favorite aspect of this book were Belfrage's leads, Alex and Matthew being comprised of far more dynamic personalities than I'd anticipated. Alex's feisty determination and Matthew's steady resolve captivated me from the very beginning. That kind of attraction is something I look for in books, it is what keeps me up after I should be in bed and what I remember long after finishing the final page. Not that Belfrage needs help in that department. Even without such intriguing characters I would have been drawn to this book. More than once I found myself lost in the steady rhythm of her story, stuck by how well and beautifully it is written. I literally tuned out the world while reading this book which is saying something with a nine month old in the house. If you haven't realized it yet I'm being deliberately vague even for me. Like Chaff in the Wind is one of those rare books that really does have something for everyone and covers such a wide scope that I am afraid to risk giving anything away. Suffice it to say this one is anything but typical and definitely better than I'd expected going into it. May she be alright, he prayed, wherever she is may she be safe and may she always know I love her. Following a 500-year-old mystery concerning a Flemish tapestry is routine work for Detective Claire DeMaere, since she's employed by the Newport Beach Art Theft Detail. But, unlike past cases, this one involves arresting Paolo Campezzi, lover to her best friend Nora. Mr. Campezzi is a distant descendant of a Florentine Duke, who commissioned the tapestry in 1520 in Bruges, Belgium. Claire finds that she must explore the true provenance of the tapestry, free Mr. Campezzi in order to re-establish her friendship with Nora and depend on the expertise of a textile expert she doesn't know. All this must occur in 72 hours, before the Vatican takes the tapestry back. But Claire isn't the only one with the Vatican looking over her shoulder. Claire's story intertwines with a 1520 diary by Beatrice van Hecke, the tapestry-weaver's daughter. Only Claire can discover the secret that is woven in time. Reading P.A. Staes The Bruges Tapestry made me homesick. I'm surrounded by cold and snow and all I can think of is a sand strewn boardwalk and the Laguna Beach sawdust festival. Needless to say I fell for this piece early on, but in reflecting on my experience with it, I find my appreciation goes beyond a simple sense of nostalgia. As carefully as one might work threads into a loom, Staes illustrates both the mechanics that go into creating a tapestry and the artistry of any given design. The obvious effort put into researching this piece really gives the book something special. I also found a lot to appreciate in Claire. She is a very realistic personality, someone you can actually imagine running into on the street. It has been some time since I've seen such a down to earth character and as a reader I really appreciated how easy it was to slip into her shoes. Most surprising, however, was the symmetry of the duel plot lines. I don't want to say too much and give anything away, but I loved how Staes connected 1520 and 2012 in multiple ways, offering up more than the historic mystery I'd expected after reading the product description. The Bruges Tapestry is a quick read, but an intriguing one that both contemporary and historic fiction fans will enjoy. "It appears you are in possession of stolen property. That tapestry is posted on Interpol as stolen from the Vatican."